All new parts spare from a Middle East race series which never happened, pads and disks have been bedded in. What you get front and rear callipers which race pads, 4x328 disks and 4xdisk bells for 5x5’’ stud pattern. Retail price for this set up is £6000.00 price to you £2250.00 inc shipping from Dubai, (you pay your own customs charges) I have a few sets so I can give a discount if you buy more than 1 set. • Optimized piston placement further reduces pad taper. • Hard anodized aluminum pistons to maintain correct piston bore and seal interface at high temperature. • Internal fluid porting to eliminate exposed cross over fluid pipes. • High temperature Caliper O-rings Seals. • Patented caliper body cross bridge cooling channel derived from Formula 1 development using CFD analysis. • Ventilated titanium piston inserts to reduce fluid and caliper body heat. • Nickel plated caliper body for better heat dissipation. • Accepts BRP 2020 pad shape up to 30mm thickness. 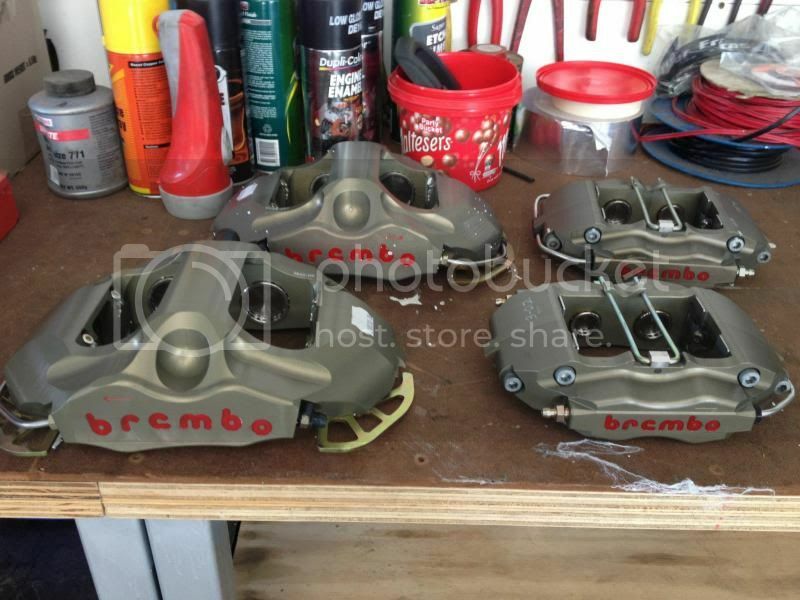 • 4 Piston mono-bloc solid bridge, using Brembo proprietary aluminum alloy. do you still have these. Need them in Dubai, so what would the price be without the shipping? And the hats of the discs will fit the E36 M3 without too many mods/grinding, how about the stock handbrake etc. Also what about getting the brackets to fit the calipers to knuckles?